Citation: Okumura JV, Junior EB, da Silva DGH, Souza Torres LD, Salvarani M, et al. (2018) CBS and PAI-1 Polymorphisms as Modulators of Clinical Severity Profile in Sickle Cell Disease. J Genet Disord. 2:5. Sickle Cell Disease (SCD) is a nomenclature used to characterize one hemoglobinophaties group that present the hemoglobin S (Hb S), whether in homozygous (Hb SS) named of Sickle Cell Anemia (SCA), or associated with others hemoglobins alterations, forming heterozygous compounds as Hb SC and Hb SD, and the interactive forms with thalassemias as Hb S/β0 - thalassemia, Hb S/β+ - thalassemia [1-3]. The SCA patients showed the most severe clinical form of SCD  and are considered to be one of the commonest genetic disorders in the world. Each year approximately 3,500 children are born with Hb SS in Brazil . The clinical severity in SCD patients is a lot variable and are results of the two main pathophysiological processes due to Hb S polymerization: vaso-occlusion, with cycles of ischemia and reperfusion, and hemolytic anemia [2,6]. These pathophysiological processes modulated the clinical manifestations in SCD patients; however, probably the interaction with environmental and genetic factors may explain the clinical diversity found in patients. The mutation of 68pb insertion (844ins68) in cystathionine beta-synthase gene (CBS - 21q22.3) contributes to high homocysteine plasma levels, and in patients with SCD, the presence of the mutation in the CBS gene is a risk factor for vaso-occlusion episodes . The plaminogen-activator inhibitor type I (PAI-1) has the function of negatively regulation the fibrinolytic pathway, once these protein inhibits the tissue plasminogen-activator (t- PA) with a decrease in fibrinolysis and an increase in fibrin clots. Then the risk to cardiovascular diseases occurrence is hight [8-10]. The PAI-1 elevated levels are modulated by 4G allele in promoter region in PAI1 gene (-675 pb 4G/5G in chromosome 7q22.1 - rs1799889) . In the present study, we seek to evaluate the influence these coagulation polymorphisms as genetics modulators of the clinical severity in SCD patients (SS, SC and SD genotypes). Four milliliters of peripheral blood were collected by venipuncture in tubes containing 5% ethylenediaminetetraacetic acid of the 462 SCD patients from the Hematology Institute “Arthur de Siqueira Cavalcanti” - HEMORIO, being 249 female and 213 male with age among 5 at 65 years-old (median 20 years-old). The only inclusion criteria was all the patients had to be older than 5 years of age because the clinical manifestations occurrence. The blood sample was used to SCD confirmation and to extract DNA from the leukocytes to investigate the genetics polymorphisms. All subjects consented to participate in this study that was approved by the Supervision and Data Security Board of the institution in accordance with the Brazilian norms and Research Ethics Committee. Hemoglobinophaties diagnoses: Alkaline electrophoresis on cellulose acetate (pH 8.6) and acidic electrophoresis at pH (pH 6.2) were used to identify the Hb profile. Quantification of Hb was obtained by high performance liquid chromatography using automated equipment (VARIANT, Bio-Rad Laboratories, Hercules, CA, USA). The genotype of Hb S, Hb C and Hb D were confirmed by molecular biology using the polymerase chain reaction-restriction fragment length polymorphism methodology (PCR-RFLP). The encoding of the mutation for beta S-globin gene (HBB*S:c.20A > T — rs334) and the C-globin gene (HBB*C:c.19G>A – rs33930165) were achieved by primer sense (5’ GGC AGA GCC ATC TAT TGC TTA 3’) and primer antisense (5’ ACC TTA GGG TTG CCC ATA AC 3’) and the amplified fragment was cleaved using the DdeI (C ↓ TNAG) restriction enzyme to S-globin gene and BseRI (GAGGAGN10↓…) to C-globin gene (New England Biolabs, Ipswich, MA, USA). The encoding of the mutation for beta D-globin gene (HBB*D:c.364G>C – rs33946267) were achieved by primer sense (5’ TGC CTC TTT GCA CCA TTC TA 3’) and primer antisense (5’ GAC CTC CCA CAT TCC CTT TT 3’) and the amplified fragment was cleaved using the EcoRI (G ↓ AATTC) restriction enzyme. Genetics polymorphisms: The polymorhism 844ins68 in CBS gene was performed to PCR using the primer sense 5’CTG GCC TTG AGC CCT GAA3’ and the antisense 5’ GGC CGG GCT CTG GAC TC 3’. The fragment size without insertion is 184 pb. Then, after the amplification the normal allele is characterized by one 184pb fragment and the mutant allele is characterized to 252pb fragment TSAI et al. The polymorphism 4G/5G (rs 1799889) was performed to PCR- RFLP. The primer sense used was 5’ CAC AGA GAG AGT CTG GCC ACG T 3’ and the antisense was 5’CCA ACA GAG GAC TCT TGG TCT 3’. The primer sense present a altered nitrogen base, adenine (A) by cytosine (C), to created the restriction site to the enzyme BselI (CCNNNNN ^ NNGG). The amplificated have 98 pb and the mutation created the restriction site to enzyme. Thus, the genotype wild (4G/4G) generated one fragment with 98 pb, and the genotype mutant (5G/5G) generated two fragments (77 and 22 pb) . Clinical severity classification: We used the online tool “Sickle Cell Disease Severity Calculator”, available in http://www.bu.edu/sicklecell/downloads/Projects, to classify the SCA patients into categories according to clinical severity (mild, intermediate and severe). The network model calculates the death risk within five years and considers this risk as a disease severity score, ranging from 0 (least severe) to 1 (most severe). The calculator requires the following variables that are sufficient to compute the score for severity of disease: age, gender, serum total bilirubin, blood transfusion, reticulocyte count, LDH, MCV, total leukocyte, acute chest syndrome, pain crises, priapism, stroke, avascular necrosis of bone and genotype of SCD. Scores ranging from 0 to 0.399 were considered mild, from 0.400 to 0.599 intermediate and 0.600 to 1.0 severe . This tool was standardized and validated by our research group for SCD Brazilian patients . Statistical analysis: Statistical analysis was performed using the Statistica 8.0 software (StatSoft Inc., Tulsa, OK, USA) and the graphics were done using GraphPad Prisma version 5.01 for Windows (GraphPad Software, La Jolla, CA, USA). The data were tested for normality by using Normal Probability Plots of Residuals. For comparison of the clinical severity score and polymorphisms genotypes frequencies among SCD genotypes, we used chi-square test. For comparison analysis between the predictor variables, we used General Linear Models (GLMs), which provides a comparison of categorical variables (predictors) and numerical (dependent variables) corrected for variables that may affect the outcome (covariates). The SCD genotypes and 68 pb (844ins68) in gene CBS and (-675 pb 4G/5G) in gene PAI1 genotypes were selected as predictors, the hydroxycarbamide use (HC), age and genders as covariates, and the severity score as dependent variables. The post hoc used was Fisher test. Data were expressed as mean ± 95% confidence intervals and considering the significance levels of 5% (p-value<0.05). 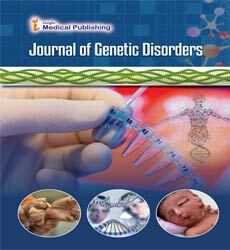 The clinical severity to SS, SC and SD genotypes varied from mild to severe, being that SS genotypes patients presented the minimum severity score of 0.08 and the maximum of 0.98; the SC genotypes patients presented the minimum severity score of 0.12 and the maximum of 0.91 and the SD genotypes patients presented the minimum severity score of 0.18 and the maximum of 0.61. According to clinical severity score mean, the SS and SC genotypes patients showed moderated severity, and the SD genotypes patients, showed mild severity. Comparing severity score among the study group, we observe the elevated score in patients with SS genotype in relation to SC genotype (p<0.01) (Table 1). N: number sample; %: percent; SD: standard deviation; difference statistic between patients with SS genotype and SC genotype (p=0.006, Fisher test). Table 1: Clinical severity according to Sickle Cell Disease genotype. Regarding the genetic polymorphisms linked to coagulation, to 844ins68 of CBS the genotype most frequent was the homozygote without insertion (Ins-/Ins-), followed of heterozygote (Ins- / Ins+), and the less frequent was the mutant homozygote to insertion (Ins+/Ins+). For the PAI1 polymorphism (-675pb 4G/5G) the genotype most frequent was 5G/5G, followed to 4G/5G, and the less frequent was 4G/4G. The genotypes frequencies of both polymorphisms evaluated were similar among the three SCD genotypes (p>0.05) (Table 2). Ins-: absence of 68pb insertion; Ins+: presence of 68pb insertion. Table 2: Genotype frequency of 844ins68 CBS and PAI1 (-675pb 4G/5G) polymorphisms. In order to verify if SCD genotypes and the coagulation polymorphisms influence in clinical severity score of the patients, we performed the GLM statistical test correcting the p-value to hydroxycarbamide use (HC), age and gender. We verified that only the interaction of SCD genotypes with the 844ins68 CBS polymorphism influences in the clinical severity score (p=0.04). The Table 3 summarizes the mean of clinical severity scores according to SCD genotypes and the genetics polymorphisms evaluated and the Figure 1 present the statistics differences among sample subgroups. In the analysis with only SCA patients no significant statistical difference was observed according to CBS genotypes (p-value = 0.82). Table 3: Clinical severity in the sickle cell disease patients according to genetics polymorphisms. 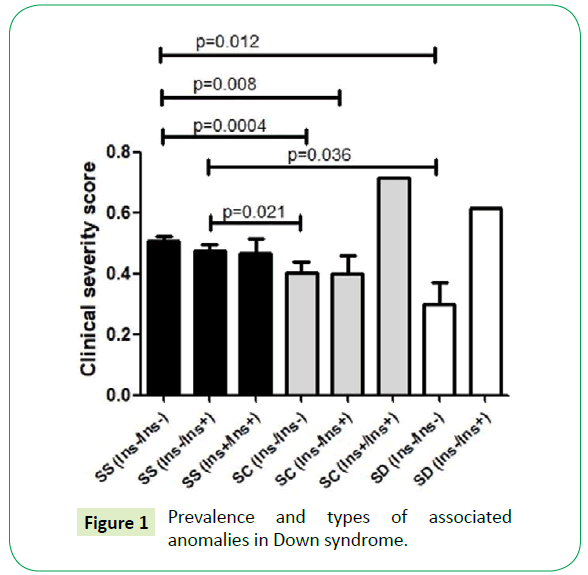 Figure 1: Prevalence and types of associated anomalies in Down syndrome. The SCA patients presented throughout life several complications of the disease resulting in elevated clinical severity, as observed in our results in which individuals with SS genotype presented higher scores of clinical severity than individuals with SC genotype. These complication occurs due the Hb S intraeritrocitary concentration are above 90, 0% in SCA patients and almost all erythrocytes exhibit shape change, leading to hemolysis and vaso-occlusion . About the vasoactivity polymorphisms, we did not observe difference in the genotypic and allelic frequencies among the subgroups. The frequence found to CBS (844ins68) polymorphism, was similar to those reported by other Brazilian researchers. In 2010, Jacob and collaborators evaluated the CBS (844ins68) polymorphism and methylenetetrahydrofolate reductase (MTHFR - C677) polymorphism in SCD patients of the state of Goias and found the highest frequency of the wild CBS genotype (Ins-/Ins-), following of heterozygous genotype (Ins-/Ins+) and the less frequency of homozygous mutant genotype (Ins+/Ins+) . Similar frequency was observed in woman abortion history in Salvador (Bahia - BA)  and in oral câncer patients from Vitoria (Espirito Santo - ES) . Also in the Mexico the similar frequence was observed in people with breast cancer and the control group . To the PAI1 (-675pb 4G/5G) polymorphism generally the 4G/5G genotype is present in approximately 50.0% of the populations studied and the 5G/5G in 25.0%  as observed in children with acute otitis media (AOM) and a control group in the Netherlands , and in people with myocardial infarction in Spain . In the present study, the above reported was not verified for individuals with SS, SC and SD genotypes, but the high frequency of the 5G/5G genotype. The probable explanation would be in the relation of the 5G allele, mainly in homozygous, with the decreased levels of circulating PAI-1. Lower levels of PAI-1 provide an increase in the action of the fibrinolytic system due to activation of plasminogen, formation of plasmin and degradation of the fibrin clot [10,21]. An activated and efficient fibrinolytic system for SCD patients can contribute to the improvement of the pathologies, especially those related to tissue repair. With this, we can infer that the high frequency of the 5G/5G genotype occurred due to a positive selection in SCD individuals. When we evaluated the interaction of genetic polymorphisms with SCD genotypes as modulators of the clinical severity score, we found an interaction of the SS genotype with the CBS genotypes. Those individuals with SCA and wild (Ins- /Ins-) and heterozygotes (Ins- /Ins +) for CBS polymorphism had higher scores of clinical severity than individuals SC and SD. The presence of 844ins68 CBS gene polymorphism is a risk factor for vasoocclusive episodes in the SCD , but nothing is known about the absence of 844ins68 CBS gene polymorphism. Forthemore, our research group observed that Hb S and CBS (844ins68) coinheritance had a dual impact on pathophysiological processes in SCA patients, contributing to the reduction of oxidation, but increasing hemolytic processes . Due to these informations and according to our results, the SCD genotype probably influenced more the clinical severity scores than the coagulation polymorphisms. The CBS (844ins68) polymorphism and SCA interaction showed influence the clinical severity in SCD patients. However, probably the main modulator this interaction was the SS genotype due the clinical complication that generates to the patient. We would like to thank Lucas Ramos Pereira (Department of Biology, São Paulo State University – UNESP) for English proofreading. The Support Foundation for Research and Extension of São José do Rio Preto (FAPERP) for the financial support. Silva is a partnership member of Redoxoma - CEPID / FAPESP (2013/07937-8). Marcus SJ, Kinney TR, Schultz WH, O’Branski EE, Ware RE (1997) Quantitative analysis of erythrocytes containing fetal hemoglobin (F cells) in children with sickle cell disease. Am J Hematol 54: 40-46. Rees DC, Williams TN, Gladwin MT (2010) Sickle-cell disease. Lancet 376: 2018-2031. Serjeant GR (2013) The Natural History of Sickle Cell Disease. Cold Spring Harb Perspect Med pp: 1-12. Frenette PS, Atweh GF (2007) Sickle cell disease: Old discoveries, new concepts, and future promise. J Clin Invest 117: 850-858. Cançado RD, Jesus J a (2007) Sickle cell disease in Brazil. Rev Bras Hematol Hemoter 29: 204-206. Steinberg MH (2008) Sickle cell anemia, the first molecular disease: overview of molecular etiology, pathophysiology, and therapeutic approaches. Scientific World Journal 8: 1295-1324. Jacob MA, Bastos CDC, Bonini-Domingos CR (2011) The 844ins68 cystathionine beta-synthase and C677T MTHFR gene polymorphism and the vaso-occlusive event risk in sickle cell disease. Arch Med Sci 7: 97-101. Nauck M, Wieland H, März W (1999) Rapid, homogeneous genotyping of the 4G/5G polymorphism in the promoter region of the PAI1 gene by fluorescence resonance energy transfer and probe melting curves. Clin Chem 45: 1141-1147. Zorio E, Gilabert-Estelles J, Espana F, Ramon LA, Cosin R (2008) Fibrinolysis: the key to new pathogenetic mechanisms. Curr Med Chem 15: 923-929. Lima LM, Carvalho MG, Neto CP, Garcia JCF, Sousa MO (2011) Association of PAI-1 Plasma Levels and 4G / 5G Polymorphism in Patients with Coronary Artery Disease. Arq Bras Cardiol 97: 462-467. Eriksson P, Kallin B, van’t Hooft FM, Båvenholm P, Hamsten A (1995) Allele-specific increase in basal transcription of the plasminogen-activator inhibitor 1 gene is associated with myocardial infarction. Proc Natl Acad Sci USA 92: 1851-1855. Margaglione M, Cappucci G, Colaizzo D, Giuliani N, Vecchione G, et al. (1998) The PAI-1 gene locus 4G/5G polymorphism is associated with a family history of coronary artery disease. Arterioscler Thromb Vasc Biol 18: 152-156. Sebastiani P, Nolan VG, Baldwin CT, Abad-grau MM, Wang L, et al. (2007) A network model to predict the risk of death in sickle cell disease. Blood 110: 2727-2735. Belini Junior E, Silva DGH, Torres LDS, Okumura JV, Lobo CLDC, et al. (2015) Severity of Brazilian sickle cell disease patients: Severity scores and feasibility of the Bayesian network model use. Blood Cells, Mol Dis 54: 321-327. Boas WV, Gonçalves RO, Costa OLN, Goncalves MS (2015) Metabolism and gene polymorphisms of the folate pathway in Brazilian women with history of recurrent abortion. Rev Bras Ginecol e Obs 37: 71-76. Barbosa A, dos Santos M, de Podestá JRV, Gouvêa SA, Von Zeidler SV, et al. (2016) Polymorphisms in methylenetetrahydrofolate reductase and cystathionine beta-synthase in oral cancer – a case–control study in southeastern Brazilians. Braz J Otorhinolaryngol 82: 558-566. Gallegos-Arreola MP, Figuera-Villanueva LE, Ramos-Silva A, Salas-González E, Puebla-Pérez AM, et al. (2014) The association between the 844ins68 polymorphism in the CBS gene and breast cancer. Arch Med Sci 10: 1214-1224. Liguori R, Quaranta S, Di Fiore R, Elce A, Castaldo G, et al. (2014) A novel polymorphism in the PAI-1 gene promoter enhances gene expression. A novel pro-thrombotic risk factor? Thromb Res 134: 1229-1233. Emonts M, Wiertsema SP, Veenhoven RH, Houwing-Duistermaat JJ, Walraven V, et al. (2007) The 4G/4G Plasminogen Activator Inhibitor-1 Genotype Is Associated With Frequent Recurrence of Acute Otitis Media. Pediatrics 120: e317-323. Martinez-Quintana E, Chirino R, Nieto-Lago V, Perez-Jimnez P, Lopez-Rios L, et al. (2014) Prognostic value of ACE I/D, AT1R A1166C, PAI-I 4G/5G and GPIIIa a1/a2 polymorphisms in myocardial infarction. Cardiol J 21: 229-237. Silverthorn D (2010) Human Physiology: an integrated approach. Porto Alegre: Artmed pp: 547-557. Silva DGH, Belini Junior E, Souza Torres L, Okumura JV, Marcel Barberino W, et al. (2017) Impact of genetic polymorphisms in key enzymes of homocysteine metabolism on the pathophysiology of sickle cell anemia. Free Radic Biol Med 106: 53-61.